When NASA's Aqua satellite passed over the Eastern Pacific Ocean, water vapor data provided information about the intensity of Hurricane Rosa. On Sept. 28, Rosa is a major hurricane, now a Category 4 on the Saffir-Simpson Hurricane Wind Scale. 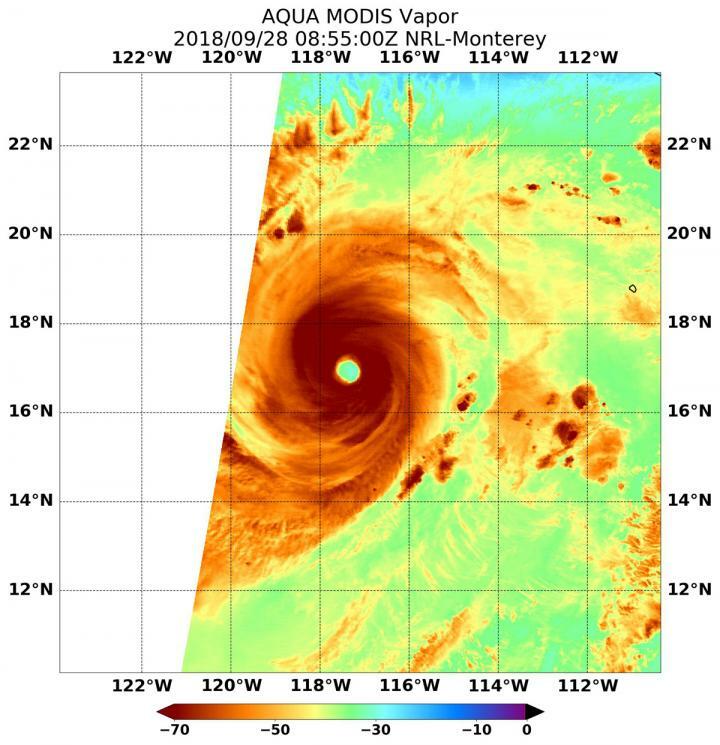 NASA's Aqua satellite passed Hurricane Rosa on Sept. 28 at 4:55 a.m. EDT (855 UTC) and the Moderate Resolution Imaging Spectroradiometer or MODIS instrument gathered water vapor content and temperature information. The MODIS image showed highest concentrations of water vapor and coldest cloud top temperatures were in a thick ring of storms around the 20 nautical mile-wide eye. Twelve hours before the MODIS water vapor imagery, the Atmospheric Infrared Sounder instrument aboard NASA's Aqua satellite provided temperature data on the cloud tops on Sept. 27 at 4:41 p.m. EDT (2041 UTC). Coldest cloud top temperatures were as cold as or colder than minus 70 degrees Fahrenheit (minus 56.6 degrees Celsius) around the eye and confirmed the later MODIS data. At 5 a.m. EDT (0900 UTC), the eye of Hurricane Rosa was located near latitude 16.9 degrees north and longitude 117.3 degrees west. That's 640 miles (1,030 km) southwest of the southern tip of Baja California, Mexico. Rosa is moving toward the west near 7 mph (11 kph). A gradual turn toward the west-northwest and northwest is expected on Friday, followed by a turn toward the north Saturday night and a turn toward the north-northeast on Sunday.